Of the people in this Oval Office photo from Jan. 28, 2017, only President Trump and Vice President Pence are still part of the administration. Reince Priebus, Steve Bannon, Sean Spicer and Michael Flynn have all left. 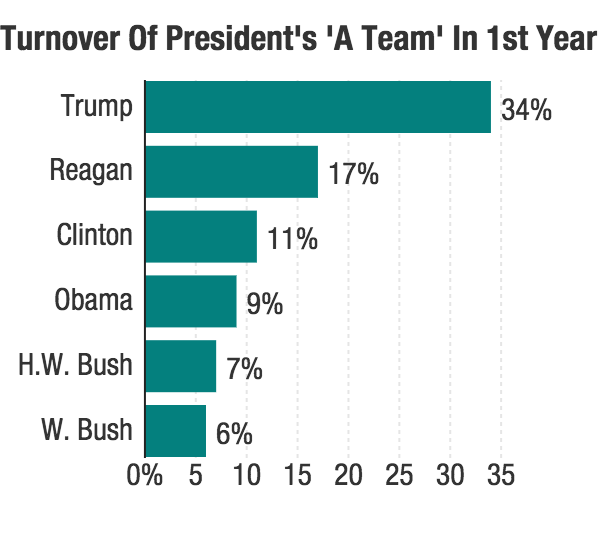 Turnover in Trump's first year was more than triple that in former President Barack Obama's first year, and double the rate in President Ronald Reagan's White House. A full 34 percent of high-level White House aides either resigned, were fired or moved into different positions in this first year of the Trump presidency. "While some turnover is expected and possibly beneficial, excessive turnover portends problems," writes Kathryn Dunn Tenpas, a nonresident senior fellow in governance studies at the Brookings Institution. "[President Trump] has valued loyalty over qualifications and suffered from a White House that has functioned in a chaotic manner. Both features have made it difficult to retain staff and have contributed to the governance difficulties he has encountered." Tenpas has another theory about why the Trump White House has had difficulty getting staff to jell: Trump prided himself on a small, nontraditional campaign. "The insurgent-like features of the Trump campaign and the relatively small campaign staff limited the pool of experienced applicants," Tenpas writes. "While it created new opportunities for many individuals who had not previously worked in the White House, such inexperience may have led to poor performance and a slew of first-year departures." 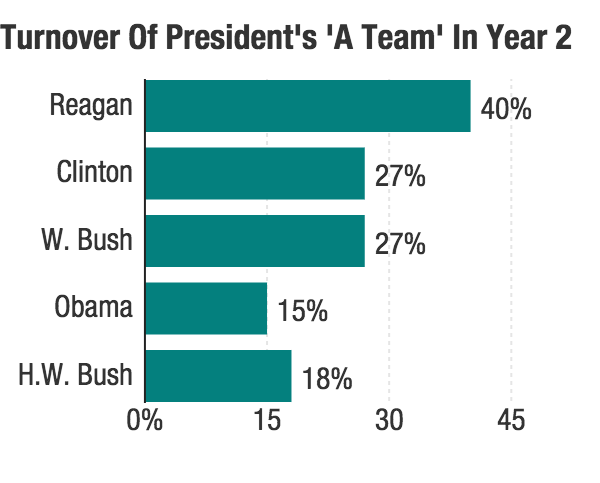 Tenpas has spent years studying White House staff turnover and has crunched the numbers going back to Reagan's presidency. "Trump's turnover is record-setting," she writes. At times it has been head-spinning. First there was former national security adviser Michael Flynn, who resigned under pressure after just 24 days on the job. His was the shortest tenure ever for a national security adviser. There were ripple effects, with several other top National Security Council staffers leaving or moving into new positions. Similarly, the naming of new chief of staff John Kelly in late July led to further staff changes. When former White House press secretary Sean Spicer's resignation was announced July 21, it marked the start of a remarkable monthlong streak of staffing chaos. That day, new communications director Anthony Scaramucci (either Trump's second or third in that role, depending on how you count), made his one and only appearance in the White House press briefing room. "This is obviously a difficult situation to be in, and I applaud his efforts here, and I love the guy, and I wish him well, and I hope he goes on to make a tremendous amount of money," Scaramucci said of Spicer. Within days Trump's original chief of staff, Reince Priebus, was out too. "The president has a right to change directions," Priebus said in an exit interview with CNN's Wolf Blitzer. "The president has a right to hit a reset button. I think it's a good time to hit the reset button. I think he was right to hit the reset button. And I think that it was something that I think the White House needs. I think it's healthy." His tenure was uncommonly short for a first chief of staff. And then just 10 days after he was introduced to America, Scaramucci was gone in a blaze of glory. Or rather, in the aftermath of a profanity-laden interview in which he bluntly assessed top White House staff. He was the shortest-serving White House communications director ever. It was the first major personnel move under new chief of staff Kelly. In short order, chief strategist Steve Bannon left as well. After that flurry of firings and resignations over the summer, the departures continued, including that of former Apprentice contestant Omarosa Manigault Newman. Tenpas says changes in key posts cause a domino effect, with deputies she didn't even track in this research moving on. "When a new chief of staff comes in or a new national security adviser, they want to bring their own people with them," she says. "So in many ways you could make the case that my data in some ways understates how much turnover has occurred in this Trump administration." Every administration is slightly different in the way it staffs the White House. Titles vary. In the past Tenpas used a list of top staff compiled by the publication National Journal, but it didn't put out its list in 2017, so she made her own list of "A Team" staff with comparable titles and responsibilities. She only counts people once, so even if they change jobs multiple times she is only counting their first move. Tenpas argues all those staffing changes have consequences, especially ones at the top. "Turnover creates disruptions, it creates inefficiencies, it affects the morale. If you see people around you getting fired at a very high level, there's a lot of angst about that," she says. In an interview on Fox News this week, current chief of staff Kelly was asked to explain all the turnover. "Campaigning is very, very different than governing. It's really, really hard work to govern at this level, and some people that were perhaps involved in the campaign didn't make that transition," he said. Kelly insisted he has brought more stability to the staff, but the departures have continued under his leadership. As for Kelly, he says he is in it for the long haul. Yet typically, the second year of an administration has much more turnover than the first. It could be that Trump got all of his out of the way in 2017, or it could be that 2018 will be just as much of a wild ride. As President Trump says, we'll see what happens. If President Trump's first year in office seemed chaotic from a staffing perspective, there's a reason for that. According to a new Brookings Institution report, turnover among top-level staff in the Trump White House set records, and it is not even close when it comes to those records. NPR White House correspondent Tamara Keith has the details, and you're hearing them first on NPR. TAMARA KEITH, BYLINE: Thirty-four percent - that's the share of top White House aides who either resigned, were fired or moved into different positions in the first year of the Trump presidency. Now, for some perspective, that's nearly three times President Obama's first year turnover and double President Reagan's. KATHRYN DUNN TENPAS: It's staggeringly high. KEITH: Kathryn Dunn Tenpas is a researcher at the Brookings Institution, a think tank, and White House staff turnover is her specialty. TENPAS: President Trump has lost half of his most senior-level staff members, and that's in contrast to President Obama, whose single departure at that level was Greg Craig, his White House counsel. And under George W. Bush, there were no departures in that highest tier. KEITH: The turnover in the Trump White House has at times been head-spinning. First, there was former National Security Adviser Michael Flynn, who resigned under pressure after just 24 days on the job. His was the shortest tenure ever for a national security adviser. SEAN SPICER: We got to a point not based on a legal issue but based on a trust issue where the level of trust between the president and General Flynn had eroded to the point where he felt he had to make a change. KEITH: That voice you just heard is now former press secretary Sean Spicer. He resigned July 21 at the start of a remarkable month-long streak of staffing chaos that also saw the arrival and departure of communications director Anthony Scaramucci and the resignations of chief strategist Steve Bannon and Trump's original chief of staff, Reince Priebus. He gave an exit interview to CNN. REINCE PRIEBUS: I think it's a good time to hit the reset button. I think he was right to hit the reset button, and I think that it was something that I think the White House needs. I think it's healthy. KEITH: His tenure was uncommonly short for a first chief of staff. 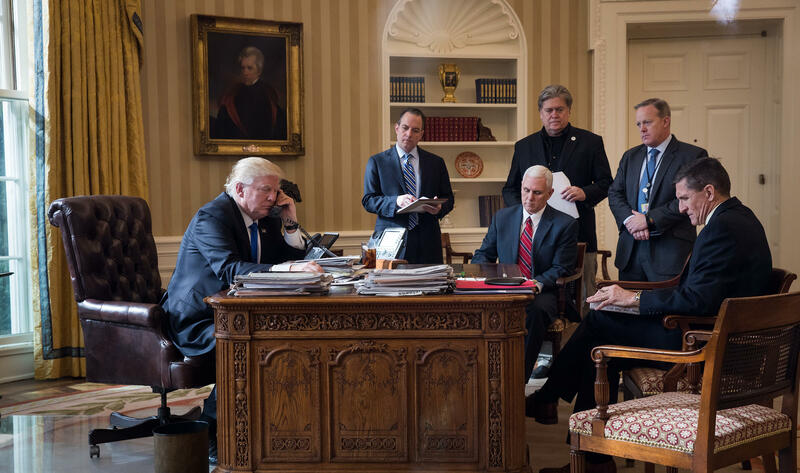 So why has the Trump White House had so very much turnover? Tenpas attributes it to a small, unconventional campaign, meaning fewer staff to bring into the White House and an emphasis on loyalty over experience. Many Republicans who had served in past administrations either weren't welcome or weren't interested. TENPAS: I think that sort of can create a situation where there's a lot of missteps, and in order to seem as though a president is taking charge and trying to improve the situation, many times they fire people. KEITH: Firing, resigning under pressure - whatever you want to call it, Tenpas argues it does have consequences. TENPAS: Turnover creates disruption. It creates inefficiencies. It affects the morale. If you see people around you getting fired at a very high level, there's a lot of angst about that. KEITH: In an interview on Fox News this week, current Chief of Staff John Kelly was asked to explain all the turnover. JOHN KELLY: Campaigning is very, very different than governing. It's really, really hard work to govern at this level. And some people that were perhaps involved in the campaign didn't make that transition. KEITH: Kelly insists he's brought more stability to the staff, but the departures have continued under his leadership. As for Kelly, he says he's in it for the long haul. But typically, the second year of an administration has much more turnover than the first. As President Trump says, we'll see what happens.